Submitted by Lovely-Ghosh-Ray on Thu, 12/24/2015 - 00:08. Christmas is a universal festival. It brings the same kind of cheer to any part of the world it is celebrated. Apart from its religious context it is also the time to rejoice in sharing, in giving and spreading the word of brotherhood around. Sharing finds many expressions in way of giving gifts, sharing a meal, entertaining family and friends, while cooking and baking for them. Cake is an essential and integral part of the whole festival. It is the bake time of the year. Back in the eighties in my hometown Kolkata, Christmas was the only time of the year when cakes would be readily available in all parts of the city. Every store irrespective of what they sold all through the year would put up a stall at their sidewalk selling cakes. Laid out on tables atop impeccable white linen are the various colorful packaged cakes. Wrapped in vibrant red, green, yellow and blue cellophane paper with ribbons adorned. Using these colored cellophane wraps actually added some mystery to the look of the cakes inside. Once opened, the cakes usually had a brown to yellowish color with a fruity flavor. The sides and the bottom used to be overdone making it harder than the rest of the cake itself. They were usually topped with small pieces of glazed red cherries and other unknown green and yellow mystery fruits. To the large Bengali community this was the picture of their much coveted ‘ X- Mas’ cake. Cake was otherwise considered to be a delicacy restricted to the Anglo-Indian community or the section of Bengalis who were considered to be Anglicized! The unwritten rule of the land is to extend oneself beyond barriers of caste, creed or religion on this auspicious day of Christmas. This day is also known as ‘Boro Din’ or the longest day of the year. 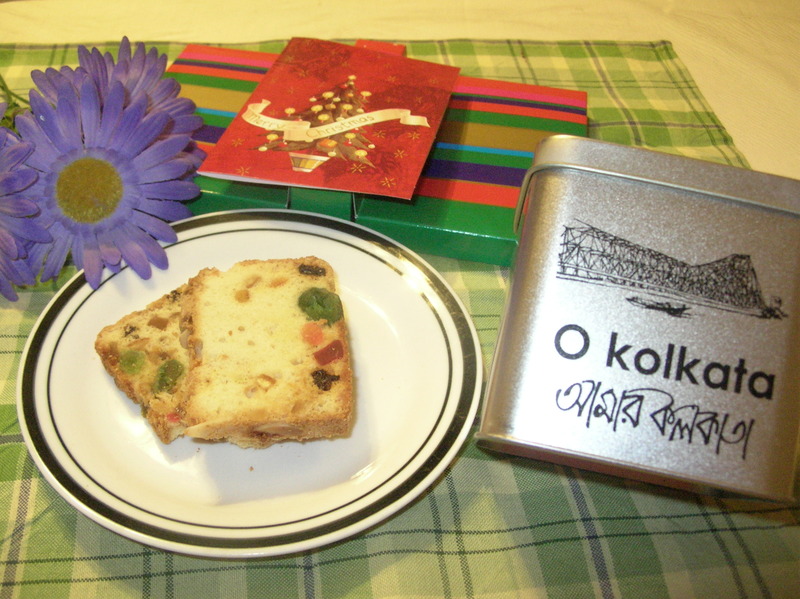 It is the Bengali way of spreading universal love and brotherhood in the community by rejoicing on their slice of cake. Though I hail from a by and large conservative Hindu family but strangely my family was open on some issues and adapted to some of the western cultures. Sending me for a convent education to a Christian missionary environment was kind of telling the world that they were an enlightened lot. I remember my birthdays being celebrated with much pomp by ordering cakes from some of the famous bakers of those times. I recall my many trips to Nahoum’s in New Market Kolkata several days before my birthday to choose my cake. On those trips we would also get a chance to sample a variety of fancy cakes sold in smaller slices as “pastries”. As I grew older we switched our loyalty to the more upscale Flury’s and Kathleen’s. As snobbish teenagers hailing from convent schools we were exposed to much finer and superior treats. The piquant plum cakes, toothsome ‘rum balls’, the divine chocolate boats or ‘boat pastries’ as they were called at Flury’s were our favorites. The heavenly Black forest treats at Kathleen’s enthralled us. We would be highly amused at the excitement of the Bengali masses over the cellophane wrapped treats that the mere mortals called cakes. It was ostentatious on my part to look at these cakes with some kind of mockery and ridicule. Decades later , at a Christmas party here in New Jersey , this arrogance in me was completely shattered, crumbled and blown away as I was humbled by the likes of those very modest cellophane wrapped cakes. To my bewilderment I saw the very similar fruit cake laid out in a beautiful crystal tray. It was the central point of attraction, the plat du jour of the party. Everyone chose a slice of it before they picked on any other cakes. At this point I was totally jolted. I could not hold my curiosity any longer. I pulled aside my friend who was of European origin to find out the specialty of this fruit cake. To my amazement here was a revelation! The fruit cake is a tradition in most European homes, especially in Italy, Spain and Portugal. In the medieval times it was eaten by the kings and royal families at Christmas time, hence it is also called a King’s cake. It was expensive to bake this cake with fruits like pine nuts, fig, raisins, orange peels, pears, almonds and walnuts at this time of the year. The citrus fruits and nuts were rare and not affordable for the common man. Down the years people gathered together as a community or as family to bake this cake to make it affordable and available for all to enjoy at this festive time of the year. Keeping up with the popularity and the expenses involved in baking this cake new twists and novelties were introduced to keep the tradition going. Dried and candied fruits were used. One fava bean and a small piece of gold wrapped in butter paper would be mixed with the dough of this cake along with the other ingredients. While eating whoever gets the fava bean in their slice has to bear the expense of the cake in the following year. Whoever gets the piece of gold is of course declared the lucky winner of the year. I was completely thunderbolt as my friend rattled on with the stories. To my astonishment I began to marvel on the great lineage that the cellophane wrapped cakes on the streets of Kolkata had been carrying for years. Strange how this cake, a royal descendant of the medieval era made its way among the masses of Kolkata. It silently carries the legacy of the Portuguese settlers in India. My ego trip came to an abrupt end as I found myself setting aside a slice of this very fruit cake to carry home for my daughter. Today I have a story to pass on to her. I was gushed with emotion as I rushed home with the fruit cake to share with my family. Probably I reflected the same excitement and exuberance of the Bengali commoner on the streets of Kolkata as he rushes home with his “X-Mas cake” wrapped in a red cellophane paper!